I definitely love sparkly statement jewelry from time to time, but in keeping with my "less is more" philosophy, I've been straying towards thin, barely-there pieces. I came across all of these while on the hunt for the perfect delicate ring to wear on my index finger. Given the fact that I've been wearing my nameplate and initial letter jewelry lately, (as seen here and here) I'm particularly drawn to #'s 8 and 9 on my list. Which do you prefer? Delicate or statement? I hope everyone has a fantastic weekend! lovely selection. i can't say i like statement pieces more than delicate ones - i like them both equally. depends on the occasion as well. but i have to admit, lately i have been quite into more chunky visible pieces - bracelets and rings. ooh these are so pretty. Those delicate bracelets are great. Love these simple, classic pieces. Especially loving the initial bangle! I love these pieces. All of them are lovely! Oh my gosh. These are all so gorgeous, each in their own delicate way! Just wondering, how did you make your collage? i love me some good statement jewelry but like you i'm now learning to appreciate delicate. loving all your choices above. I just love number nine! i adore this collage, beautiful jewels i want them all! 12 and 8 are my favorite ! Something to love !! such beautiful jewelry! love the post and your blog... i would love if you checked out my blog, as I'm just getting started and would love your feedback. love all of them and also your blog! It's so nice!!! I follow you! Really great choice of accessories! I really like them all! OMG #9 and #12 are amazing! I want them! 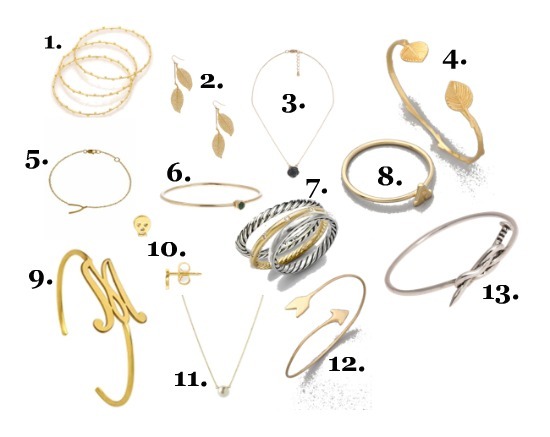 I've been really madly in love with delicate accessories recently as well, great picks!! 2, 9, and 7 are my faves. All gorgeous. Thanks for your sweet comment I know that there are people that doesn't follow really a blog....so I decided to follow you first (you can find me among GFC)!!! NICE POST! !I LOVE NUMBER 3 AND 4!!! looked at a lot of your posts, your blog is really worth to follow! I would be honored if you would follow me as well. I love minimal jewelry, this set is gorgeous. Nothing like putting a few pieces on and feeling like that is all you need! Great picks! I love them all. I'v recently started a jewelry line that consist of dainty, feminine, classy, and timeless pieces. It's styles like what you put on here that influence my work and I love it!